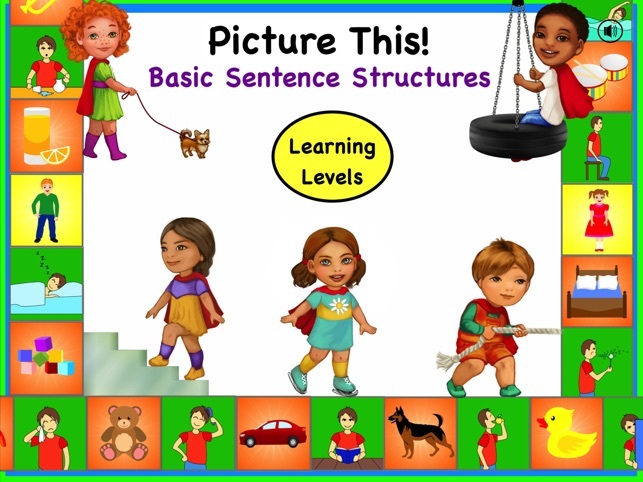 Get three sentence structure sequencing and development applications in one bundle! 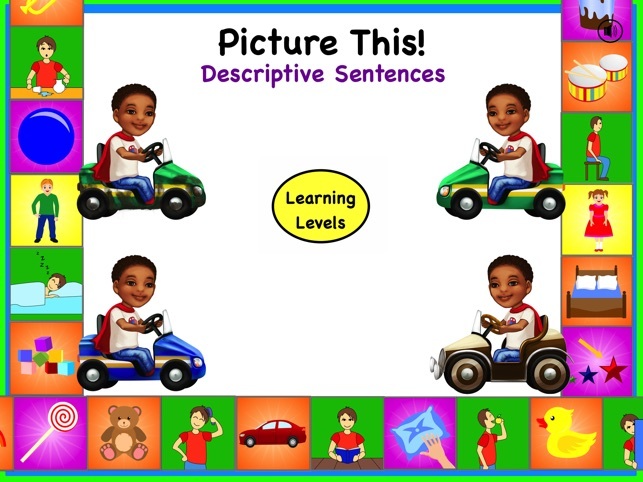 Use these applications to teach children basic sentence structures by sequencing visuals of the different components of sentences. The child's progress can be measured over time using the integrated scoring system. 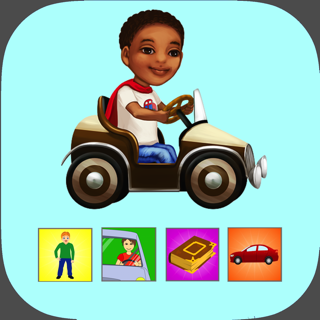 These applications were written and developed by Australian Speech Pathologist, Alana Noakes, to fill a gap within the iPad application market for comprehensive and research-based early language development applications. When shown an action picture and asked the question 'What is happening? 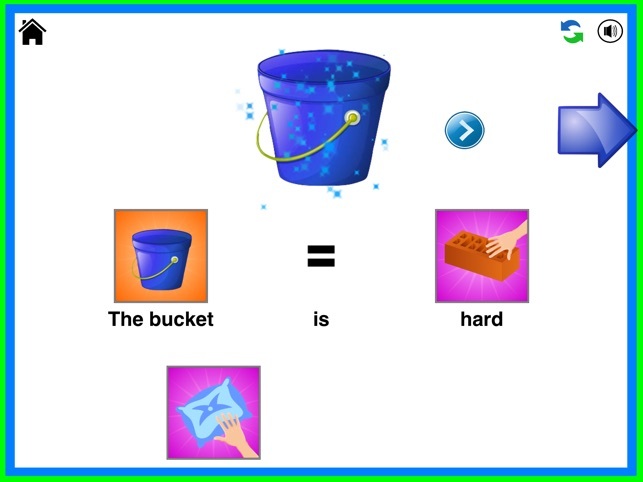 ', the child must select each part of the sentence and correctly sequence them to form the targeted sentence. 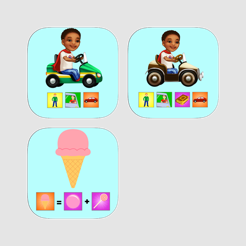 The child can then say the sentence in sequence with the audio or by himself/herself. 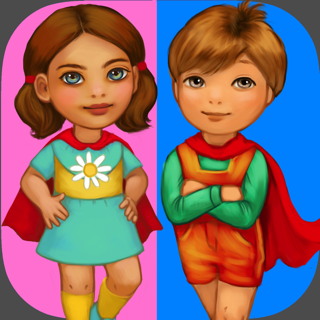 Use this application to learn a total of 154 sentences/phrases, each with a beautiful picture illustrating the action scene. 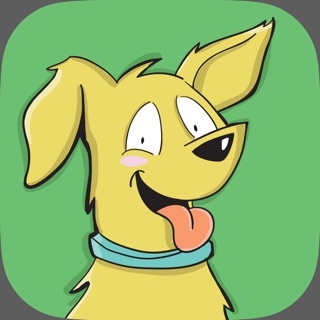 The adult can select which sentences for the child to learn before beginning each level. Learn how to describe action picture scenes by including adjectives in the sentence structure; Subject-Verb-Adjective-Object. When shown an action picture and asked the question 'What is happening? 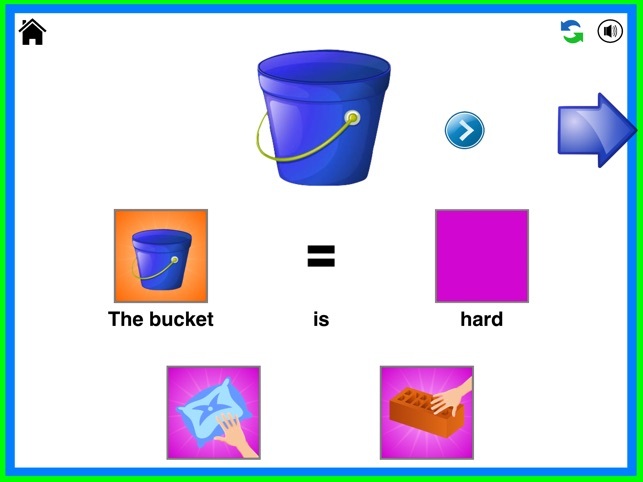 ', the child must select each part of the sentence and correctly sequence them to form the targeted sentence. 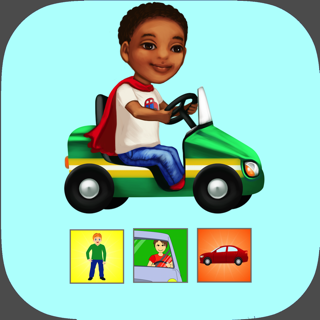 The child can then say the sentence in sequence with the audio or by himself/herself. 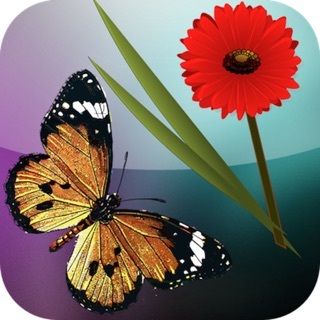 Use this application to learn 98 sentences, each with a beautiful picture illustrating the action scene. 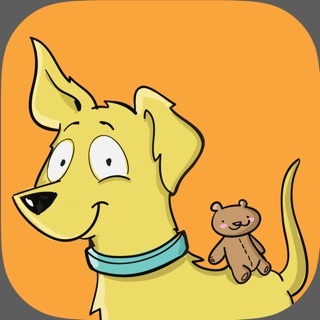 Choose from 10 levels to play, each focusing on a different set of adjectives. 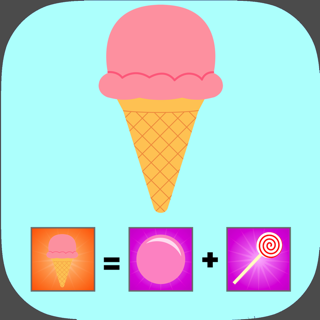 Level 1: Colours (adjectives include; white, yellow, pink, orange, red, green, blue, purple, brown, black, colourful). Level 2: Shape (adjectives include; round, square, rectangular). Level 3: Patterns (adjectives include; spotty and stripy). Level 4a: Size (adjectives include; big and small). Level 4b: Size (adjectives include; long and short). Level 4c: Size (adjectives include; tall and short). Level 5: Temperature (adjectives include; hot and cold). Level 6: Material (adjectives include; plastic, wooden and glass). Level 7a: State (adjectives include; dirty and clean). 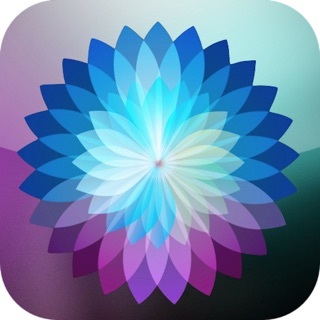 Level 7b: State (adjectives include; new and old). Learn how to use adjectives to describe different objects, by sequencing the visuals of the different components of the sentence (i.e. the 'object' and the 'adjective'). 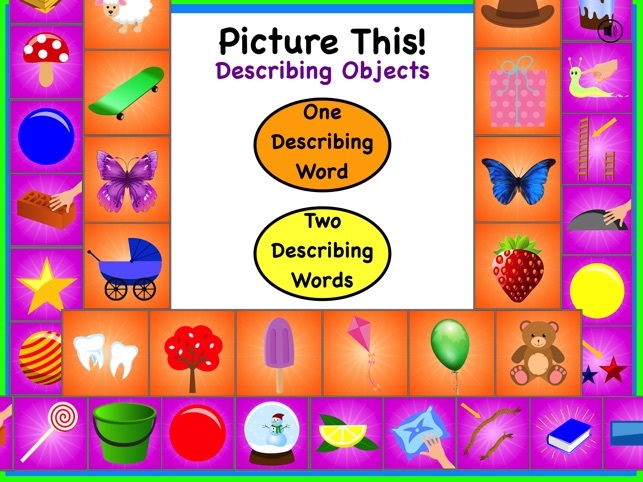 When shown object and asked to 'Describe this object' or 'Tell me about this object', the child must select each part of the sentence and correctly sequence them to form the targeted sentence. 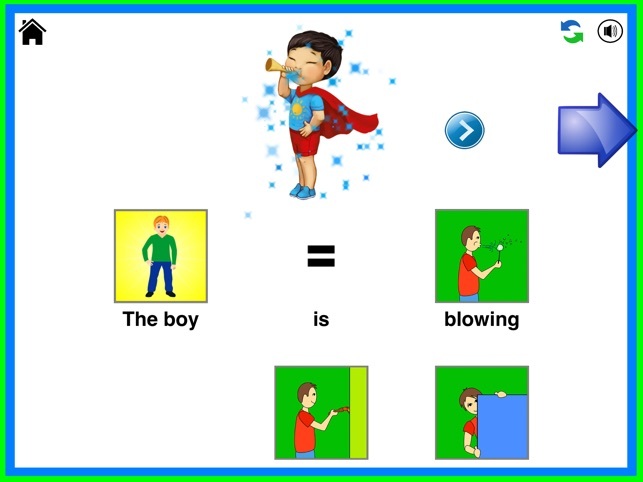 The child can then say the sentence in sequence with the audio or by himself/herself.